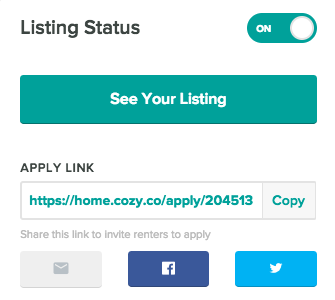 When you create a listing in Cozy, you'll receive a link you can share anywhere- in an email, on social media, or on your website. Any renter with this link can apply to the rental. You can also advertise the listing on doorsteps.com and realtor.com for free. Once you've added a property to Cozy, visit the Listings section and click "New Listing." Here, you'll add details about your rental, including a short description and at least one photo. You can ask applicants to submit credit reports and background checks when they apply, or you can request those screening reports later. Screening report purchases are paid for by the applicants (those cost applicants $24.99 for one report or $39.99 for both). Once you’ve gone through these steps, you’ll see a page where you can preview and review your listing. Click “Listing Status” to begin collecting applications. After activating your listing, you can share it with our advertising partners. 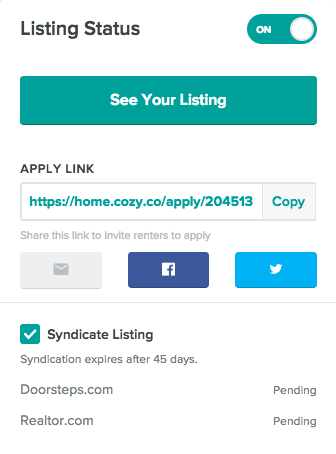 If the "Syndicate Listing" option is checked, your listing will be advertised on our partner sites doorsteps.com and realtor.com in about 24 hours. Watch the video below to see how to set up a listing and how applicants apply. Cozy will send you an email when a renter submits an application to your property. To see your applications, visit the Application tab and click "View" next to the property you'd like to review. Here you'll see who has applied to that property and when they submitted their application. Each applicant will have a Renter Profile, where you can see their employment and income details, residence history, references, emergency contact, and standard screening questions. The application will also display the applicant's reported income to rent ratio, and whether they have submitted screening reports or not. See an application and the info you'll collect. Create a Listing Gallery to show all your available units on one page and add your contact info. Learn how roommates, spouses, and co-signers can apply together. Turn off a listing if the rental is no longer available. Receive more interest from renters with these tips on creating a great listing. Calculate the rent amount for your property with a Rental Analysis report.